There is nothing pretentious, or confusing, about this title. Plainly put, this is a book of some of the most emblematic stories which appeared in the New York Times during the 1960’s. I don’t say the most important; although there are a number of those; I say emblematic because that what this book is. It is a wonderful representation of the things which made the 1960’s the memorable decade which it was, and still remains. Organized into 8 sections covering 317 pages the book begins with the top stories in National news beginning with the Woolworth’s lunch counter sit- ins; which would come to characterize the Civil Rights Movement for much of the decade. That was on February 15, 1960. By November of that year JFK was President and Eisenhower bid us a farewell, warning us against the “military-industrial complex” which he had helped to create. The March on Washington, the Civil Rights demonstrations; and riots; are all covered. This section of the book speaks loudly to the little news junkie I was back then; with my 6 transistor radio always glued to my ear, or under my pillow at night. In addition to the Civil Rights Movement, the National section also recalls the death of General MacArthur, JFK’s assassination, and just about every other important news item which would have an impact on the rest of the decade. The last article in this section is from August 1969, and is about Charles Manson. The International section begins with a typo in the article about Francis Gary Powers being shot down over the Soviet Union in a U-2. The heading reads May 9, 1965. It should be 1960. The accompanying photo is dated correctly. From Eichmann’s kidnapping in South America to Krushchev pounding his shoe at the UN, this section is very colorful. The world still had some pretty colorful political leaders left; political correctness had not yet begun in earnest, making it possible for Politicians to still act somewhat candidly. The beginnings of our real serious involvement in Vietnam is chronicled; as well as the Communist expansion in just about every corner of the world; including Cuba. The rise of the Berlin Wall, the death of Pope John XXIII, Diem’s assassination only weeks before JFK’s killing, Israel fighting with Palestine, it’s all here. Mandela convicted of sabotage and sentenced to life in South Africa, while our own streets burned with the desire for freedom recall my struggle to make sense of why Apartheid was wrong in South America while it was still being practiced here in the United States. Communist China getting her own bomb, and Ho Chi Minh’s death, close out the International scene. The Business Section begins with a raise in the minimum wage in the United States. JFK pushed through a bill making the new wage $1.15 per hour. The steel crisis; when Kennedy faced off with the steel producers over a price increase which would have triggered mass inflation; DOW breaking 1,000 points for the first time; the Bank of America rolling out credit cards; and oil leases in Alaska all show a vibrant and growing economy. 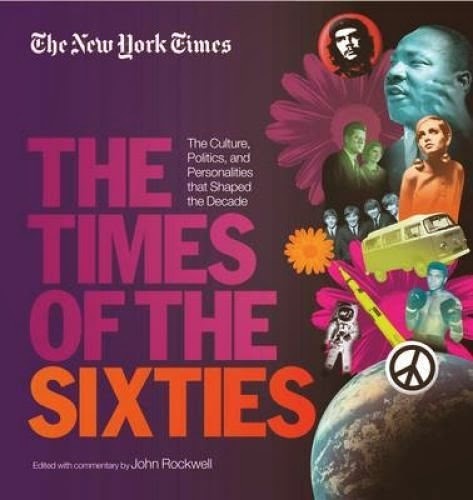 There is a section devoted solely to New York City; which is appropriate, given that this book is about the New York Times coverage of the 1960’s. First up is Casey Stengel being let go by the Yankees for the crime of being 70 years old. The next big story is the collision of 2 airliners in the fog over New York, one landing in Park Slope section of Brooklyn; and then the fire on the aircraft carrier Constellation at the Brooklyn Navy Yard, which killed 46 and injured hundreds. Both of these horrific events happened one week before Christmas in 1960 and so always stand out in my memory.TV news broke both of these stories to me. I was just 6 years old. The Twist, the folk music scene and a young Bob Dylan at Gerde’s Folk City; the World’s Fair; Shea Stadium; the Verrazano- Narrows Bridge; the theft of the Star of India from the Museum of Natural History; the Blackout of 1965; all of these stories took me back to my days delivering the New York Post by bicycle; reading the headlines as I loaded up for work each day. Science, Technology and Health is subdivided into 3 shorter categories. Science dwells on the Space Race; which we were losing at first. The Soviets put a man in space before us; orbited the earth before us; even space walked before we did. But we cheered our astronauts on to victory with the first manned landing on the Moon. If you were alive then you will remember that day and how it felt. Technology concerns itself with portable electric typewriters and battery powered tooth brushes, the advent of the cassette as the wave of the future in music; and the first “jumbo” jet, a Boeing 747. The only thing still relevant is the battery powered toothbrush. All of the other achievements have been surpassed. But my toothbrush is still about the same; only cheaper. Health covers the first Pacemakers, plastic contact lenses, open heart surgery, Medicare, cigarettes causing cancer; birth control and lung transplants. Life and Style is one of the more interesting sections as it directly affects us all. From Barbie dolls to Mustangs, skateboarding and marijuana, this section is fairly representative of the way we were back then. Fashion covers Jackie Kennedy, miniskirts, Audrey Hepburn, big glasses and Twiggy in a highly entertaining way. The articles fairly sing the praises of the subjects they explore. Food and Drink is another section which is fairly interesting. It’s easy to forget that a microwave once coat about $1,200 in 1955. By 1962 this had dropped to $795, still out of reach of almost all Americans at the time. The rise of fast food and artificial sweeteners also dominated the news at the time. Sports is a vivid recollection of the Lakers, Wilt Chamberlain, the Mets, Roger Maris, the first Superbowl, the consolidation of the NFL and the AFL, Cassius Clay becoming Muhammad Ali, and the triumph of the Mets over Baltimore in 1969. Arts and Entertainment starts off with the architectural achievements in New York at the time. From the new airline terminal at Idewild; with its observation deck; to the opening of the Pan Am Building, and the Whitney in Manhattan, the changing skyline of Manhattan reflected the rapidly changing world. When the book gets to Music and Art it really showcases the color and dynamics of the 1960’s. From the Beatles to James Baldwin and everything in between, this is one of the most entertaining sections. Andy Warhol and his Chelsea Girls film had me running to the computer and You Tube to see what I missed as a kid. Ava Gardner reading “The Feminine Mystique”, Monty Python, A Clockwork Orange, Tom Wolfe, James Earl Jones, Andy Griffith, Hair and Woodstock are all represented as examples of the culture of the times. The last entry, closing out the section and the book, is the Altamont Concert in California. It’s always interesting to look back and see how far we have come in certain areas; and how little progress we have made in others. In 1961 the Senate was struggling with the issues of healthcare and equal pay for women; both of which are still unsettled today. It's possible that we have not advanced socially as far as we would sometimes like to believe. Maybe we haven't come "such a long way baby". Inadvertently, perhaps that is the message of this wonderful book.